In a small saucepan over low-medium heat, melt butter and stir in corn starch. Pour in the milk, add cream cheese, and continue to stir until mixture is fully incorporated. While stirring mix in cheddar and jack cheeses, chili powder, paprika, and hot pepper sauce. Continue to stir until cheese has melted and all ingredients are well blended. Pour over tortilla chips. Thank you my cheesy friends!! I now know what I’ll be eating this weekend. You’re welcome, NachoMan. Please feel free to come on back and leave some comments after you’ve tried it out. I’ve tasted this amazing elixer and it is indeed a delicious blend of cheesy goodness. I almost don’t want to eat it with a chip because I want every taste bud to enjoy the flavor. Mmm mmm yummy! I couldn’t wait until Saturday; I had to make it tonight. IT WAS AMAZING! The best thing about it is the cheese taste so fresh and has a bit of a zest to it. Compared to jar or canned cheese you get from the grocery store, this recipe is hands-down a winner. It’s quick and easy to make also, took me just a few minutes and the whole family enjoyed it. We also dipped our sandwich bread into the cheese which was tasty! Waht’s the best brand of store bought nacho cheese and where do I get it? Liquidman – If you refer back to the post “Taste Test: Cheese vs. Cheese” back in our January archives, we compare the Tostitos brand nacho cheese to the Fritos brand nacho cheese. We concluded that the Tostitos nacho cheese in a jar is the way to go. I made the goodness today but was disappointed when I couldn’t find the Busha Browne’s at the store. I purchased the Habanero Tabasco. I think I might be missing out as my sauce wasn’t hot enough 🙁 I had to add chopped Jalepeno’s for fire. Any suggestions of where to buy Busha’s? If you want to find it locally, I would recommend visiting more of a boutique or specialty market. In the San Francisco Bay Area, I would recommend Draeger’s or Molly Stones. The easiest n tastiest homemade cheese recipe!!! just reading the directions makes me bounce off the walls!!! i havent tried it yet but thank you for describing it!!!! Oh, this is so sad. I am pregnant, so I’m craving nacho cheese even more than I normally do. But, I live in a very remote part of Ireland, where very few cheeses are available. These people have a whole aisle full of cheddar, but NO MONTEREY JACK. Can anyone suggest any kind of substitute for it in this recipe? And of course, forget the Busha’s, unless someone sends it to me from the States. Thanks for the recipe. I’ll be trying this one out for sure. NEEDNACHOCHEESE, this recipe is not movie nacho cheese. The ingredients used in this cheese are much more fresh and don’t include any partially hydrogenated oils. Now, if you are looking for that movie theater cheese, depending on what state you live in, the best place to go is Costco. They sell massive, bulk containers of cheese used for commercial applications like snack shacks and movie theaters. If you don’t have Costco near you, try Sams Club or any large warehouse-style store. Would using the shredded kraft mexican cheese and bagged kraft shredded sharp chedder be acceptable in this recipe, or are you shredding your own? will advise on bagged/shredded output tonight. i think i’ve got everything but that brand of sauce (but i have a strong habanero) and i may or may not have the cream cheese so i may have to do a substitution. either way, thanks for the recipe. my own escapades into nacho cheese has revealed that seemingly any mixture of cheese, milk, butter, and hot sauce, when melted slowly and stirred thoroughly, produces an approximate version of what you can purchase in the cans. Yes you can use shredded bag cheese like that from Kraft, though we are using cheese from a block that we grate ourselves. We’ve tried it with bagged cheese and it tastes pretty darn good. What happened to the nacho chip warmers? How come no one mentions chip warmers? I want to hold bulk nacho chips and eat them when they are warm and crunchy…..mmmmmmm! Great thought! I actually wrote an article on a nacho chip warming tray a few months ago. I found the flavour of this cheese to be pretty good, but really didn’t like the grainy-ness from the corn starch. I happened to watch the new episode of Heston Blumenthal’s In Search of Perfection, and he was looking at making a consistently meltable cheese at home, and tried corn starch as well, but decided it was too grainy. He ended up using food-grade sodium citrate. A bit of car needs to be taken to stop the citrate from imparting a bitter flavour, but supposedly does an excellent job of making sure that the proteins and fats in the cheese stay emulsified. I’m going to get a friend who works at a pharmacy to get me some sodium citrate, and will report back once I’ve tried it. I would like to make this for my husband’s birthday party, but we need a lot of it! Have you made large quantities of this and kept it warm in a crock pot? Any suggestions would be great. Thanks! THANK YOU!!! I have been searching for a recepie that did NOT use Cheese Food. Wonder wonderful stuff!!! I have been searching the internet for a great NACHO cheese sauce. Just plain original nacho cheese sauce you would get at movies, gas stations, or carnivals. I think I’ve found an even better version of this sauce. Thank you, can’t wait to make it for my family. OM-G! I have found my people. Nacho cheese rules! I tried to make the beloved nacho cheese on the fly and curdled, it did! I will try the official recipe now that I have found the beam of light from heaven that is ilovenachocheese.com. I am going to try this when i get the ingredients. From what the comments say this must be amazing. I didn’t know nacho cheese was a different kind of cheese. Thanks! Holy Crap, I thought I was the only Nachoman out there. I am Nachoman of the Portland Nachomen. I tip my hat to my fellow nacho lovers all over the world. This recipe looks top notch, I will be sure and make a batch and revel in its cheesiness. Why doesn’t Nacho Cheese exist in a hard cheese form? It would be so good sliced on a sandwich, and make a delicious addition to any cheese tray. Is it possible to produce hard nacho cheese? If so, why hasn’t anyone done it? I tried this recipe and was not impressed. The sauce ended up being really greasy and not smooth at all. It had good flavor, however it was not a creamy, pourable sauce but rather clumped together. Is there some sort of trick to getting it to be creamy? I have to disagree with everyone. I made this recipe tonight, and I was not impressed. It did not have the right flavor. I added some velveeta to it, and that made it a bit better, but it’s still not right. It doesn’t have that nacho cheese taste at all. I’m going to keep looking for a recipe I like. The recipe has one problem I can tell you without even bothering to make it. It will clump into a stringy greasy mess almost every time. Some people have mentioned this. To avoid that,you need a double boiler. If you have two pans that fit right,you can sometimes make a makeshift one. The idea of a double boiler is that you heat one pan,with a water bath in the second pan. It provides controllable heat and makes certain the temperature never goes above 100F. Sometimes you end up getting a clumpy result anyway even in a double boiler so I cant say the recipe will work,but its next to impossible not to get a clumpy result of you don’t use one. unfortunately I found the result not at all like the one sold in cans. Bummer, since where I live you can’t reach the cans. Nice recipe, try this one as well! 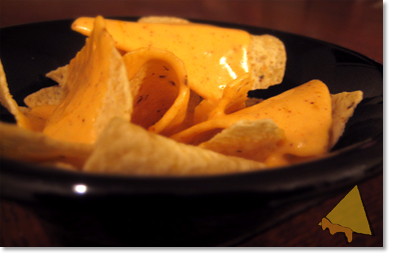 Try this site for a very good Nacho Cheese Sauce recipie. I have tried a few and this is definitely the best!! Sorry missed the link off the last post. For Sarah Rose – Sharp cheese is called mature in the UK! I LOVE THIS RECIPE I AM GIVING THIS CHEF A 3 MINUTE STANDING OVATION!!!!!!!!!!! BEST NACHOS IVE HAD SINCE HIGH SCHOOL!!!!!!!!!!!! I MADE THIS AT MY SON’S BASKETBALL GAME AND EVERYBODY WANTED THE RECIPE. SO I TOLD THEM!!!!!!!!!!! THIS NACHO RECIPE IS DA BOM!!!!!!!!!!!!!!!!!!!!! Hmmm this was not very good, The chili powder and paprika overpowered the cheese taste. The consistancy was good, however. I think I will try it again, sans chili powder and paprika and go with Good Ol New Mexico Green Chile. Maybe I did something REALLY wrong, but this was seriously disgusting. I could only take one tiny bite of it just to say I actually taste it but it was inedible just from the look of it. Seriously, I don’t know where the hell you guys have tried Nacho Cheese at before but if this is the best you can do you’re obviously not pros at Nacho Cheese. Stick with Tostitos Medium Queso at the grocery store, way better than this crap. Greasy GREASY clumpy mess. Click on my name to see a picture of what it really looks like, and yes, I followed the directions to a T and consider myself a pretty good cook. The greatest site ever! I live in England and there is no way I can have nachos outside of the cinema! My sister brought me back some nacho cheese from the US and i finished it within weeks! This recipe will surely change my life! Many Thanks Fellow Cheese Lovers! im gonna favorite this page and make this when iget back to the states! can’t wait! This site rocks! Thanks so much for this cheesey goodness! I can’t wait to try it. I am so excited and thrilled there are other nacho cheese lovers out there! i do not like this stuff. its not like nacho cheese, its like melted cheese with not enough kick to it. The way the recipe is written is flawed. The reason people’s sauce is clumping is because the starch needs to be cooked briefly in the butter to coat all of the starch granules. After a couple of minutes of cooking the corn starch then add the milk, stirring vigorously until the butter starch mixture is incorporated(I recommend using a whisk). Let the mixture come up just to a boil, the starch will then release into the milk and thicken very rapidly. At this point the sauce should be almost like a pudding texture. Reduce the heat to just below boiling and slowly incorporate the cheeses and spices. If you let it sit and boil it will separate, and turn into a greasy, globby mess. The trick is adding the cheese slowly after you have thickened the milk, and always letting the cheese melt before adding more. I found too that this was not like what you’d buy in the store, so I tried making it again but added several types of polysaccharides, hydrogenated oils, monoglycerides and diglycerides, Sodium Stearoyl-2-Lactylate, disodium hydrogen phosphate, and lots of MSG, and it tasted just like the canned stuff! I also added Yellow No. 5 and 6 to make it look more real. Okay, hopefully you caught both my sarcasm and my point. Of course this is not going to be similar to what you’d buy in the store or get at the movie theater or ball game. That stuff has a bunch of crap in it that tricks your taste buds into thinking it’s good. My recommendation: make the recipe with organic cheese and milk, and savor both the flavor and the thought that you’re not poisoning yourself. Anyone know how well this recipe keeps? I’m having friends over tomorrow night and it’d be great if I could make it tonight (when I have lots of free time) and refrigerate it.